Custom logo imprinted marathon pedometer- orange is a choice of gift for all those who give importance to health. This pedometer bears a step counter, which can count up to 99, 999 steps. By investing in this pedometer, you are not only countering with fellow health afficandos, but also eyeing to inch your goodwill or brand name closer to their consciousness. This marathon pedometer is perfect to promote walkathon events, marathons, athletic events and more. You can avail exciting price savings by bulk ordering it from us. 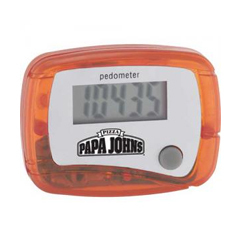 Request a quote to know the value savings that you can avail on bulk orders of promotional marathon pedometer- orange.